The third and final installment of the Christian Bale Batman set is the weakest of the series. The original (Batman Begins) is an imperfect origin story that throws fun in our faces to distract us from a plot that’s been done to death and action that’s a bit silly. But it doesn’t matter in the end; the film is pure entertainment from the beginning, succeeding in becoming something uniquely good because it never tries too hard. The sequel (The Dark Knight) stumbles for exactly that reason; it tries too hard, goes too dark, and exposes bad acting far too often. Heath Ledger is, obviously, the savior of the film, keeping it watchable when everything else fails. 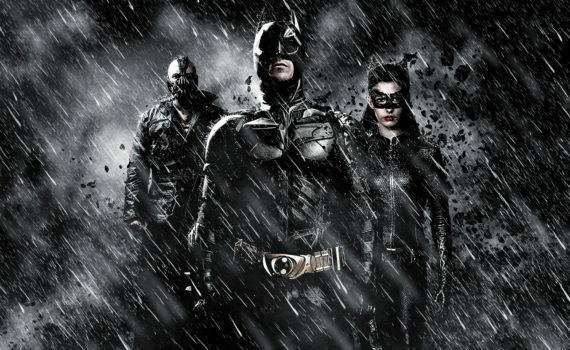 And now we come to the end (The Dark Knight Rises), Batman’s curtain call, and the last we’ll see of this franchise. After becoming Batman, taking the fall for crimes he did not commit, and retiring to his Manor, Bruce Wayne has grown brittle. He’s depressed, he feels useless, his company is floundering, and Gotham is weakening as he sits on the sidelines. But when a man named Bane enters the game, Batman must rise to defend his city one last time. Bane wants to burn the world, taking over Gotham by force, threatening to kill its citizens. Batman teams up with a cat burglar named Selina to stop Bane’s evil plans, but his ties to the evil Ra’s Al Ghul make Bane difficult to defeat. Bruce will have to use all his cunning and his gadgets to stop this madman, save Gotham, save himself from an early grave, and return the Dark Knight to the light. It’s not that Dark Knight Rises is terrible, it’s that it’s tedious and overdrawn. As a standalone film, it’s actually better than Dark Knight, if you’re willing to take Heath Ledger out of the equation. But this film doesn’t have a star to save the day like that one had, more’s the pity. Tom Hardy? As amazing of an actor as he is, he doesn’t fit this role, goes too far with the strange voice, and never seems like a hateable villain. If you’re looking for heroes look no further than Anne Hathaway & Joseph Gordon-Levitt, they both shine here, though neither of them has a big enough role to save the movie. In the end, all we get is more of the same; Alfred lecturing Bruce, Batman feeling lonely, someone trying to destroy Gotham, a semi lovestory, Jim Gordon commanding thousands of policemen to run around the city. And lastly, this installment had so much more hand-to-hand fighting than the others and it was all terrible. Terrible, terrible, terrible. I was left feeling fairly disappointed in a movie that succeeds in capping off the trilogy, sticks to its guns, has a few memorable scenes, but never thinks outside the black, bat-shaped box.